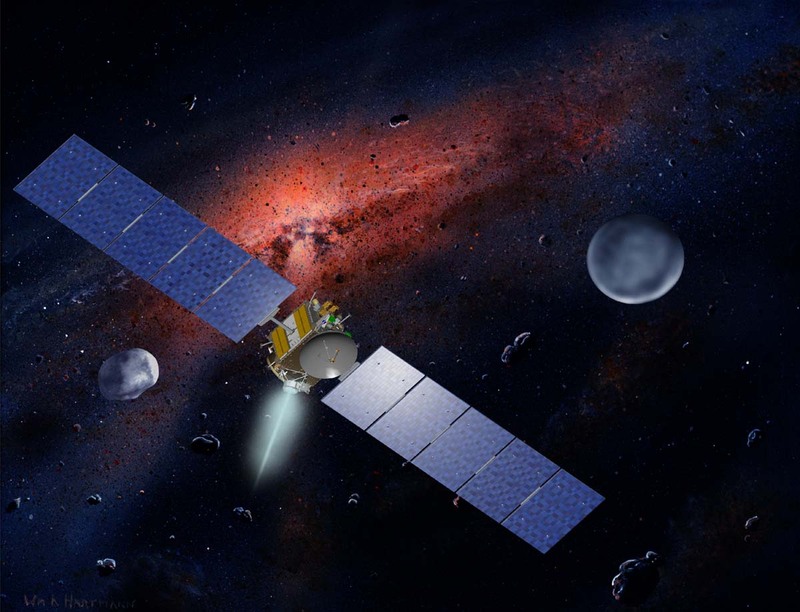 Artist’s rendering of Dawn spacecraft, with asteroids. Largest are Vesta and Ceres. Credits: Dawn spacecraft—Orbital Sciences Corporation; background art—William K. Hartmann, courtesy UCLA. This summer, NASA will launch a probe bound for two unexplored worlds in our solar system’s asteroid belt - giant asteroids Ceres and Vesta. The probe, called Dawn, will orbit first one body and then the other in a never-before-attempted maneuver. This is a trip that calls for the unconventional. “We’re using ion propulsion,” says Rayman. The ion engines for the Dawn spacecraft proved themselves aboard an earlier, experimental mission known as Deep Space 1 (DS1). Because ion propulsion is a relatively new technology that’s very different from conventional rockets, it was a perfect candidate for DS1, a part of NASA’s New Millennium Program, which flight-tests new technologies so that missions such as Dawn can use those technologies reliably. Ion engines work on a principle different from conventional rockets. A normal rocket engine burns a chemical fuel to produce thrust. An ion engine doesn’t burn anything; a strong electric field in the engine propels charged atoms such as xenon to very high speed. The thrust produced is tiny—roughly equivalent to the weight of a piece of paper—but over time, it can generate as much speed as a conventional rocket while using only about 1/10 as much propellant. And Dawn will need lots of propulsion. It must first climb into Vesta’s orbit, which is tilted about 7 degrees from the plane of the solar system. After studying Vesta, it will have to escape its gravity and maneuver to insert itself in an orbit around Ceres—the first spacecraft to orbit two distant bodies. Dawn’s up-close views of these worlds will help scientists understand the early solar system. Find out about other New Millennium Program validated technologies and how they are being used in science missions at http://nmp.nasa.gov/TECHNOLOGY/infusion.html . While you’re there, you can also download “Professor Starr’s Dream Trip,” a storybook for grown-ups about how ion propulsion enabled a scientist’s dream of visiting the asteroids come true. A simpler children’s version is available at http://spaceplace.nasa.gov/en/kids/nmp/starr.